Who Decides if a BP Spill Claim Is Legitimate? As catastrophic as the Gulf oil spill has been for the region's environment and residents' livelihoods, experts say the impact of the disaster on human health and well-being has not even begun to be quantified. Since April 20, when 11 workers died aboard the Deepwater Horizon oil rig that went up in flames  an accident that has since spilled more than 100 million gal. of oil into the Gulf of Mexico  the toll in deaths directly attributable to the spill has remained unchanged. But things took a turn on Wednesday: William Allen Kruse, an Alabama fisherman who reluctantly took an oil-spill cleanup job with BP, was found dead from a self-inflicted gunshot wound. He left no suicide note, and we'll likely never know why he took his own life, but friends told the media that he had been deeply troubled by the spill and the destruction it caused on the coast. Kruse may be the first casualty of the oil spill itself, but he is not likely to be the last as the accident continues to affect the bodies and psyches of Gulf Coast residents. "These are people in a serious crisis," says Dr. Irwin Redlener, president of the Children's Health Fund and director of the National Center for Disaster Preparedness at Columbia University. "They're at ground zero of a catastrophe." The question is what shape the impact of that catastrophe will take  mentally, physically, emotionally  on the people of the Gulf, now and for generations to come. Much is unknown about the long-term health dangers of an oil spill; few spills have been studied in this way. A group of doctors and scientists who gathered in New Orleans on June 22 and 23 for a conference on the issue, hastily put together by the Institute of Medicine, came to the inevitable conclusion that a massive, multilateral effort must be launched now to track the health effects of the spill over time  and that researchers were already falling behind. "We have an unknown number of people exposed to an unknown danger," said Dr. Lynn Goldman, a professor at the Bloomberg School of Public Health at Johns Hopkins University, at the conference. "There has not been preparedness in the public-health community for dealing with something of this magnitude." 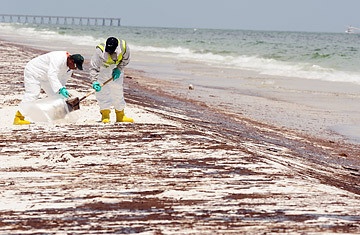 What is certain, however, is that the mix of oil and chemical dispersants washing up on the Gulf shoreline could be immediately dangerous, especially for the tens of thousands of workers and volunteers involved in the cleanup. Fumes in heavily oiled areas may overwhelm spill responders  there is widespread concern that some workers are not being given sufficient safety equipment, including respirators  and volunteers, who may not have as much training or experience as hired workers, could be in the greatest danger. So far, more than 400 oil-exposure complaints have been logged by poison-control centers and 100 oil-spill-related illnesses have been reported, mostly by cleanup workers, but these maladies may be just the tip of the iceberg. The most imminent and serious risk for cleanup workers is perhaps not the oil or the chemicals but the killer Gulf heat. In New Orleans, the temperature is 91°F, with a heat index of 100°F, and I know from my experience reporting on the spill that the Gulf sun is merciless. For workers who have to wear full safety equipment  including white plastic protective garb, with gloves  the heat could take a fatal toll. According to the Occupational Safety and Health Administration, which is monitoring safety in the oil-spill response, more than 100 cleanup workers have been treated for heatstroke, and that number will certainly grow as the summer stretches on. "Exertional heat stroke is our critical concern," said Thomas Bernard, an occupational health expert at the University of South Florida. Still, there is the potential risk of toxic exposure to the oil and the chemical dispersants. Dr. John Howard, director of the National Institute for Occupational Safety and Health (NIOSH), told Congress this week that oil could be irritating to the skin or the lungs and could cause vomiting if swallowed but "is unlikely to have long-lasting health effects." Despite comments by Howard  and BP representatives  the reality is that we know far too little about the effects of oil spills on human health to have any confidence in the long-term ramifications. At the Institute of Medicine conference, Nalini Sathiakumar of the University of Alabama noted that of the 400 tanker spills that have occurred since the 1960s, only seven have been studied. And they provide reason for caution. Oil isn't just oil  it also contains volatile organic compounds like the carcinogen benzene. "Studies [of spills] have shown us consistent evidence for oracular, neurological and dermal exposure as a result of exposure to volatile organic compounds," said Sathiakumar. "Short-term lung, kidney and liver functions could be affected." Indeed, a retrospective study of cleanup workers involved in a 2002 oil spill on the coast of Spain  one far smaller than the Gulf catastrophe  found evidence of DNA damage, most likely from chemical or oil exposure, though it was of the sort that can be repaired by the body. If scientists hope to track spill workers and coastal residents who are currently encountering oil, studies must be launched right now. To that end, the Department of Health and Human Services has set aside $10 million to track oil-spill-related illnesses, while more than 14,000 BP spill workers  about half the total force  have volunteered for a NIOSH tracking system. "To be able to identify chronic effects, you have to start very early," Howard told Congress earlier this month. But independent scientists worry that these studies are too small and that the data is insufficient. They are also concerned about the reliability of the data, especially that for BP's workers, whose claims of illness are screened by a private medical service paid for by BP. Given the fact that any evidence of serious health effects could be used against the company in the countless lawsuits we'll see filed in the coming months and years, the potential conflict of interest is obvious. Workers also may fail to come forward out of fear of losing their job  they've already shown reluctance to talk to the press for the same reason. The researchers at the Institute of Medicine conference said they have already seen large gaps in the surveillance data to date. "It's kind of scary" that the cleanup response is being run by the company at fault, not the government, said Linda McCauley, dean of Emory University's school of nursing. The lack of transparency can further lead to a lack of trust in the communities affected by the spill  and that suspicion can have a long-lasting, corrosive impact. In the wake of the Exxon Valdez spill, the small Alaskan fishing port of Cordova saw a rise in domestic abuse, alcoholism and eventually suicide. Lawsuits eroded trust in the community, and clean data on the impact of the spill became almost impossible to get. Researchers worry that the BP spill, which is far larger, will have the same insidious effect on the psyches of Gulf residents, many of whom are just now recovering from hurricanes Katrina and Rita. "Anyone who says the people of this region do not need evaluation for mental-heath risks have no idea what is happening here," says Redlener of the Children's Health Fund, who visited Gulf residents earlier this week. It doesn't help that the spill is an unprecedented trauma, and a continuing one  nearly 70 days after the Deepwater Horizon sank, the spill is ongoing, and Gulf residents still have no idea when it will end. Adding to their frustration, shores they have cleaned of oil may be oiled again. And perhaps the greatest insult is that the company chiefly responsible for the ordeal, BP, is the one handling the response and handing out checks. As the reality of the spill sinks in  the fact that the Gulf Coast will be changed irrevocably  the anxiety will only worsen. And so William Allen Kruse may have been only the first in an unknowable number of casualties. See the world's top 10 environmental disasters.